Does VC increase or decrease choice on the web? I’ve been thinking a lot about pricing lately as I work with one of my startups on our pricing strategy. As I was trying to works things out, it struck me that venture capital or the lack of it has a huge impact on pricing strategy and what we as end users or consumers get to use in the market. Many of the services or sites that we use today would not exist without venture capital. Twitter is a clear example. Tens of millions of users later it has consumed lots of VC$ and is just beginning to commercialize. Closer to home (for me anyway), Tungle continues to offer an amazing and entirely free scheduling service to the market. This of course would not be possible without VC funny money. What I am wondering is whether, as consumers / users we have more or less choice as a result of VC investment in web startups? For sure, those companies that attract VC$ can afford to go free and offer great services without asking for money. That presumably increases choice in the market. But what about those startups that cannot or will not raise VC$? Do they have a level playing field to compete on? As a user will you go with the slightly better service from a self funded company that needs to charge you? Or will you opt for a slightly worse service if the company offering it is funded and does not charge you? Continue reading Does VC increase or decrease choice on the web? Posted on February 17, 2010 February 23, 2010 Categories Web 2.0, Business ModelTags 37 signals, Angels, VC, freemium6 Comments on Does VC increase or decrease choice on the web? Is there too much free in freemium? Jott– the voice to text service that lets you leave notes for yourself is killing its free service. So too is Sprout. Even Google is getting in on the act, quietly axing several free services. I’ve also noticed lately that Linkedin the poster child of B2B freemium success is quietly cutting back on the limits of their free offering. I can no longer forward a job posting to all my connections. There are artificial limits. Continue reading Is there too much free in freemium? 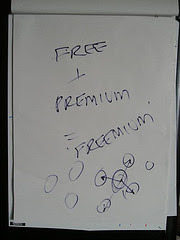 Posted on January 15, 2009 February 6, 2010 Categories Growing Big, Management, freemium, Web 2.0, Business ModelTags freemium11 Comments on Is there too much free in freemium?